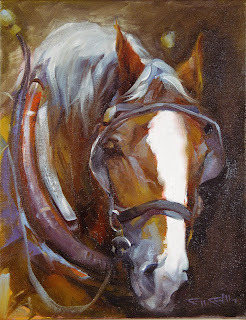 I've always admired this painting of "Lucky" and entered it in the Equine Acadamy of Art show but it failed to jury in but I did get it into a show and competition held by the Westcoast Paper Company. Although I will miss this painting should it sell I will be delighted for whoever ends up with it. If I held onto all the paintings I like I wouldn't be making much of a living. Lucky is one of the best work horses I've ever had. I raised him from a foal. He's called Lucky because he's lucky to be alive when he was born. The boys wanted to see a foal born so we slept in the barn. I got up thinking it must be time and found my mare Sister looking like she was ready. I got the boys up and we waited, and waited until finally I called the vet. She instructed me to stick my hand in there and see what was going on and when I did there was nobody home. There I am with one arm up to my shoulder and talking on the portable phone to my vet when Stephen Jeffries, a visitor from England, happened to look over the bank and said, "What's that?". I looked over the bank and there was Lucky, all curled up and cold. What a dunder head, the other horses kept siding up to the barn fence and whinnying. I thought they were trying to encourage Sister when all the time they were trying to get my attention to come down and rescue this poor little critter. I hurried on down and picked up the little guy and packed him up the hill. Talk about imprinting. We've been buds ever since. I never had to "break" him. I just showed him once and he got the idea. He's about as honest and bombproof as I have ever seen in a horse. He paces himself in the field and can outwork any other horse on the place without breaking a sweat. I think this portrait of Lucky, captures his personality and my love for the guy. I especially like the different textures I achieved. The dexterity of brushwork and harmony of value and color is exceptional too if I don't say so myself. Oh, there are deflugalties (new word) but I'm not going to say anything if you won't.